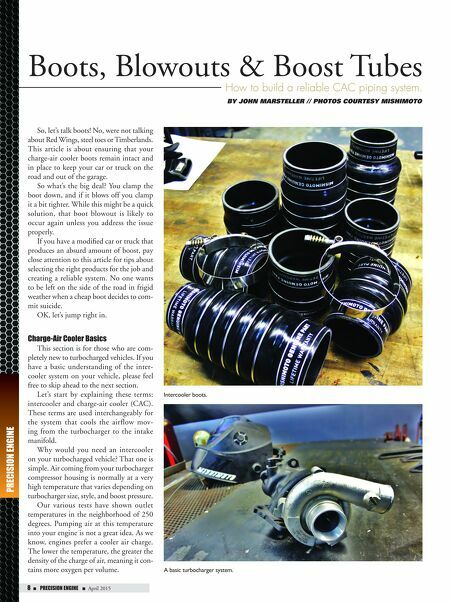 88 n Performance & Hotrod Business n April 2015 8 n PRECISION ENGINE n April 2015 PRECISION ENGINE So, let's talk boots! No, were not talking about Red Wings, steel toes or Timberlands. This article is about ensuring that your charge-air cooler boots remain intact and in place to keep your car or truck on the road and out of the garage. So what's the big deal? You clamp the boot down, and if it blows off you clamp it a bit tighter. While this might be a quick solution, that boot blowout is likely to occur again unless you address the issue properly. If you have a modified car or truck that produces an absurd amount of boost, pay close attention to this article for tips about selecting the right products for the job and creating a reliable system. No one wants to be left on the side of the road in frigid weather when a cheap boot decides to com- mit suicide. OK, let's jump right in. 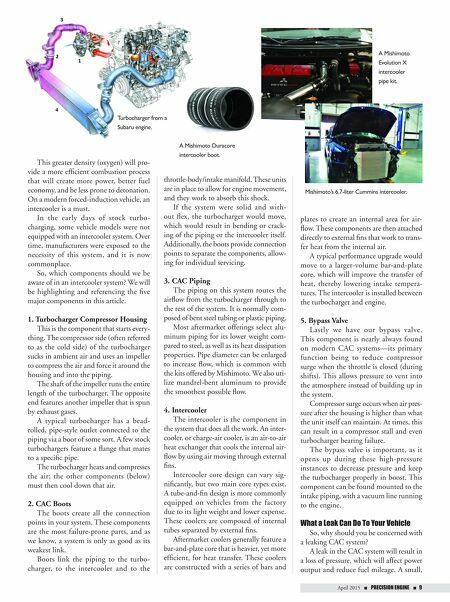 Charge-Air Cooler Basics This section is for those who are com- pletely new to turbocharged vehicles. If you have a basic understanding of the inter- cooler system on your vehicle, please feel free to skip ahead to the next section. Let's start by explaining these terms: intercooler and charge-air cooler (CAC). These terms are used interchangeably for the system that cools the airflow mov- ing from the turbocharger to the intake manifold. Why would you need an intercooler on your turbocharged vehicle? That one is simple. Air coming from your turbocharger compressor housing is normally at a very high temperature that varies depending on turbocharger size, style, and boost pressure. Our various tests have shown outlet temperatures in the neighborhood of 250 degrees. Pumping air at this temperature into your engine is not a great idea. As we know, engines prefer a cooler air charge. The lower the temperature, the greater the density of the charge of air, meaning it con- tains more oxygen per volume. Boots, Blowouts & Boost Tubes How to build a reliable CAC piping system. By John Marsteller // Photos courtesy MishiMoto Intercooler boots. A basic turbocharger system.